You’ve noticed it? Fancy coloured diamonds are suddenly on everyone’s lips! The Reason being not so much their impenetrability but the simple fact that they are extremely rare, making not only a unique gift but also a great investment. And who wouldn’t like to have jewels to rival the collection of Queen Elizabeth II, one of the biggest collectors of coloured diamonds in the world? The Australian Argyle mine produces about 90% of the world’s pink diamond supply. Allegedly this mine will cease in the next few years which makes pink diamonds more and more exclusive every day. Is it a marketing trick? Will it really cease? No one knows. But considering the fact that pink diamonds compromise less than 0.01 per cent of global diamond production, it doesn’t really matter. It will cease eventually – that’s the nature of the beast. Brown diamonds are the most common fancy coloured diamonds. They used to be not a big thing until the late 1980s, when the market was flooded by the Argyle mine and DeBeers. Short after that, the ugly word brown disappeared and the industry started to call them chocolate diamonds or used other mouth-watering expressions like champagne, cognac and tobacco coloured diamonds. Blue diamonds are the crème de la crème when it comes to coloured diamonds. They are exceptionally rare and they don’t come in such a wide range of saturations as pink and brown to yellow diamonds do. They often display a hint of grey, so you’ll rarely get that deep blue effect you know from sapphires. Colour is the dominant factor – and size and shape can influence that. The bigger the diamond, the deeper the colour. 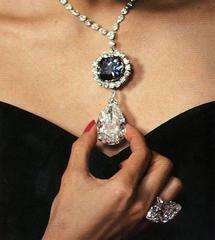 A 68 carat blue diamond like the French King Louis XVI wore, would make the cut but who can afford that? Besides that, it got stolen during the French revolution and has never been seen again. It eventually became the Hope Diamond, weighing 45.52 – but what happened to the missing 22.48 carats is something that keeps historians wondering about ever since. Now we’ve come to the queen of all fancy coloured diamonds: The green diamond. They can be found in pure colour but like anything else in nature they usually come with a second hue which makes them even more magical and allows the customer to choose his or her favourite colour much like using a pantone guide. Green diamonds get their colour when radiation displaces carbon atoms from their normal positions in the crystal structure. This occurs naturally only when lying near to radioactive rocks. This is also the biggest problem when it comes to green diamonds: The same radioactive process is used to produce fake coloured diamonds. It’s almost impossible for an untrained eye to distinguish between a fake and a real green diamond – only a laboratory test can tell. Why coloured diamonds instead of gem stones? Excellent gems with few inclusions are very expensive too but they will never sparkle as brilliantly or strong as a diamond. 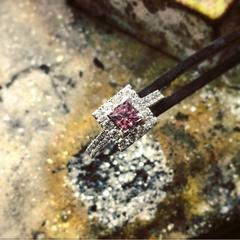 Just always keep in mind that many coloured diamonds are treated to intensify their colour. If that’s a deal breaker for you talk to a jeweller you trust to make sure you get what you’re paying for.